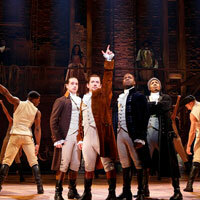 Producer Jeffrey Seller and Broadway In Chicago announced that a new 16 week block of tickets for HAMILTON at The PrivateBank Theatre (18 W. Monroe) will go on-sale Tuesday, August 29. Tickets will be available for performances through April 29, 2018. Tickets for the new block will go on sale on Tuesday, August 29 at 10:00 a.m. and will be available at The PrivateBank Theatre Box Office, the Broadway In Chicago Ticket Line (800-775-2000) and online at Ticketmaster. The PrivateBank Theatre Box Office will be open for advance sales from 10:00 a.m. to 5:00 p.m. There is a maximum purchase limit of 12 tickets per household for performances January 9 through April 29, 2018. Tickets range from $65 - $190 for regular performances with select number of premium seats available for all performances. There will continue to be an online lottery for forty-four (44) $10 seats for all performances. Lottery seat locations vary per performance but will always include seats in the first row. Visit www.BroadwayInChicago.com/HamiltonLotteryFAQ or download the new official Hamilton app at HamiltonBroadway.com/app for more lottery information.